SpecOut found the 10 best laptops for college students in 2016. To be selected, each computer had to fit specific battery, storage and weight requirements. Analysts considered different budget considerations and broke the list down into price categories of less than $500, $500 to $800, $800 to $1,100, $1,100 to $1,400 and more than $1,400. 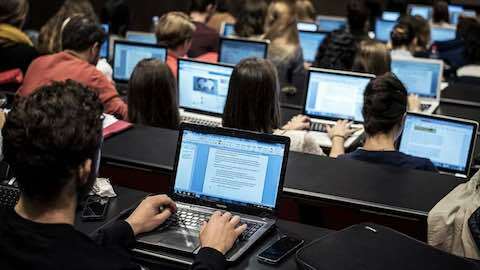 It is important to note that a student's major will play a role in his or her choice of laptops. An English major who surfs the web and writes a lot of papers, for example, will have completely different storage, graphics and RAM requirements than an engineering student who runs powerful design software. Inexpensive compared to the average all-purpose laptop, this Dell is as portable as it is cheap. The detachable two-in-one format enables it to convert into a fully functioning tablet with little more than a snap. With a Core i3 engine that is fast enough for most users, the Pavilion x360 13t is notable for its powerful audio and flexible design. The touch-screen feature enables users to closely interact with the operating system. This Zenbook comes with a full HD touch screen that is surprisingly resistant to glare. The speakers are weak but the keyboard and trackpad are cutting edge. Fast and portable, this revised XPS 13 has a long battery life and a display so brilliant that it looks bigger than its 11 inches. A direct challenge to the MacBook Air, Computer Shopper called it "perhaps the best all-around Windows laptop you can buy." With smooth 360-degree hinges, a full 12-hour battery life and a truly impressive display, the Spectre x360 is packaged in a handsome aluminum body. It's not as light as a MacBook Air, but it easily converts to tablet mode. The best MacBook Air available in this price range, the 2015 Base Model is equipped with 8 GB of graphics memory, which equips it for intense gameplay. Its i5 core processor is fast, and it boasts an impressive 12-hour battery life. Surprisingly small, this Dell is wrapped in a sturdy, carbon-fiber body. The laptop boasts a fast dual-core processor, beaming 1800p resolution and a staggering 18-hour battery life. The MacBook Pro saw the arrival of the innovative new Force Touch trackpad, and impressive gains in speed and battery life. The storage is just satisfactory and the design hasn't changed, but the display is truly stunning. With a lightning-fast, 2.4-gigahertz dual-core processor, an impressive 12-hour battery life and a detachable hybrid tablet, the Surface Book is ergonomic and powerful. It comes with a satisfactory 8 GB of RAM, but can be upgraded to a full 16 GB. With a blazing-fast hard drive, a strong nine-hour battery life and 220 pixels per inch, this big, 15.4-inch MacBook Pro works hard to justify its price tag. For gamers, however, the graphics may not be worth the investment. Personal Tech & Gadgets "Best Laptop Computers for College Students"